This is a portrait of my grandaughter Alisha Valverde done in transparent watercolor. I like the combination of realism mixed in with impressionism. 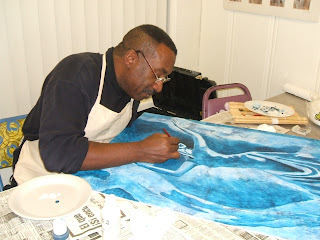 This is an example of what I teach at my studio in Glendale AZ. Thank you Sabine, for nominating me ROCKIN' GIRL BLOGGER...this old gal likes the "girl" part the best. It's my turn to nominate five bloggers (only five?) Well here goes. 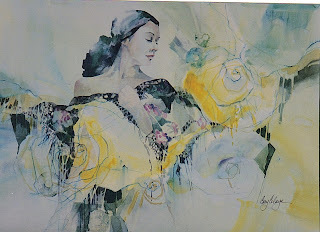 http://lauriezuckerman.blogspot.com/ You haven't seen alters till you see these... gorgeous. http://zeborahloray.blogspot.com/ The original technique junkie, and a good one. http://studiostuffgirls.blogspot.com/ Linda's canvases are wonderful...my kind of art. http://mosshill.blogs.com/joannas_journal/ I visit this blog almost daily. I have not met Joanna but she is an inspiration in more ways than one. http://www.efratunspokenlanguage.blogspot.com/ Creative and cute...it's not fair. 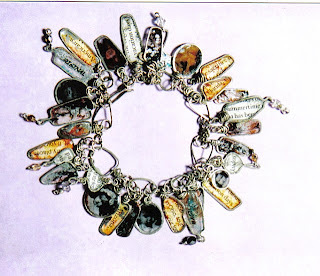 This light weight delicate charm bracelet was a project not chosen for Art Unraveled 2007. Made last year for my daughter Corrie Anderson, it features handmade wire wrapped charms with family photos and text embedded in Opal resin. A charm bracelet class will be scheduled soon at Cory's Art Studio. Contact artwithmoxie@cox.net for class information. Anthony Hall adding detail to his models face with his favorite three hair brush. 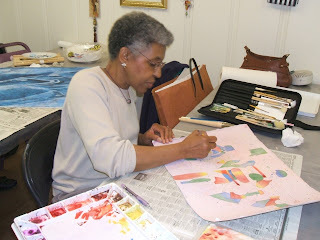 This is the extra large faux painted background that I spoke about during my class at Art Unraveled 2007. Anthony is a very disciplined student who creates good art and is also, a great photographer. Ella Holland busy working out a design in watercolor. Ella is one of my faithful Wednesday night students who will tackle any project in the name of learning. ( I think she just likes hanging out at my studio ) Ella has come such a long way and is producing beautiful art pieces. You Go Girl!